ZFC - 18. The Centennial Era The Centenary of the U.S.
18. The Centennial Era The Centenary of the U.S.
Overlapping the Westward Expansion of the United States was the centenary of the United States. 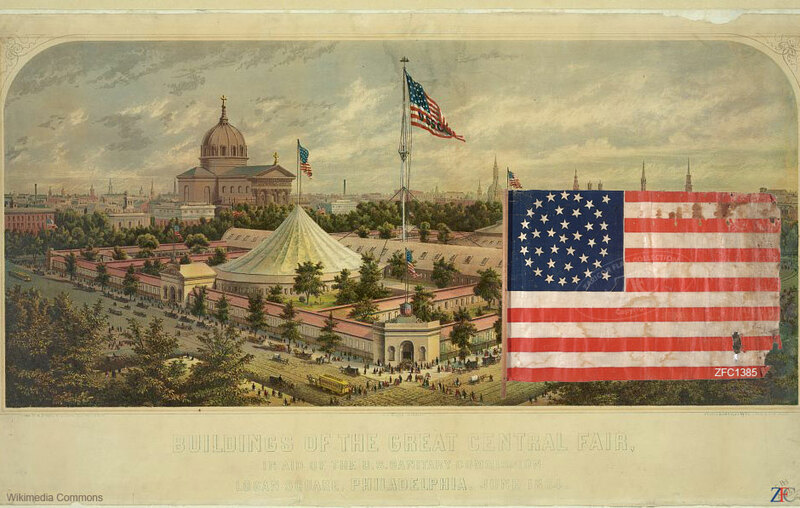 Celebrated nationwide, the centenary was the theme of the Centennial International Exhibition, which was successfully held in Philadelphia, Pennsylvania. This was the first "World Fair" and it offered the nation a rich opportunity to see a whole host of different flags. The U.S. began the centennial year with a flag bearing 37 stars, but statehood for Colorado Territory was looming on the horizon and it offered a chance for both entrepreneurs and artists alike to design new star fields bearing 38 stars instead of the original 37. Presented here are 37 and 38-star flags appropriate to the Centennial Era, the last in which the United States flag retained its "Folk Art" quality. After the 38-star flag, most flags would bear their stars in horizontal rows, which was an arrangement favored by large manufacturers. CONFIDENTIALITY NOTICE: This Website, and any contents or web pages attached may contain confidential information, including information that is legally privileged. You are hereby notified that any entry into this site or disclosure, copying, distribution or use of any of the information contained in or attached to this site is strictly prohibited. If you have any knowledge of attempts to enter this site wrongfully, please immediately notify us via e-mail or phone. This system contains privileged and confidential information and is intended for the exclusive use of Zaricor Flag Collection ("ZFC") personnel and our clients. Only authorized ZFC personnel or specifically authorized clients are permitted access to this system. Any unauthorized use of this system is unlawful, and may be subject to civil and/or criminal penalties. All access to this system is monitored and may be used as evidence in court. If you are uncertain of your authorization status please contact us.